September 8, 2018 – Found only in the Galapagos Islands, it's thought that marine iguanas evolved from South American land-dwelling iguanas that drifted out to sea millions of years ago on rafts of vegetation or debris. They may look menacing with their spiky spines and razor-sharp claws, but instead of meat, these iguanas love to chomp on algae underwater. 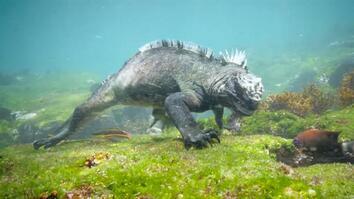 Marine iguanas scrape the algae from rocks with the help of their short snouts and sharp teeth. 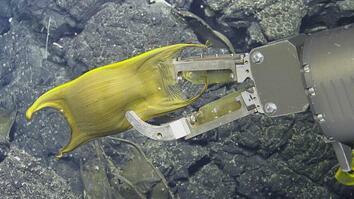 Long, flattened tails are well-adapted for swimming through the water, much like crocodiles. While Charles Darwin may have described their appearance as “hideous-looking,” as the only ocean-swimming lizard species in the world, the unusual features of these iguanas are beautiful in terms of evolutionary survival. only on the Galapagos Islands. currents and back on shore. to absorb heat from the sun. and unique place in our world.